Shining structure floaters: are they vitreous opacities or a phenomenon of consciousness? Floco Tausin challenges the official medical explanation by presenting his observations, researches and the teaching of seer Nestor. Shining structure floaters: are they vitreous opacities or a phenomenon of consciousness? Laser surgery and vitrectomy as floaters treatment? Tab. 1: In ophthalmology, shining structure floaters are believed to be vitreous opacities. Tab. 2: Some types of eye floaters can be treated by laser surgery and vitrectomy. Tab. 3: The perceptions during open eye meditation reveal distinctive qualities of eye floaters. Tab. 4: "Dual structure:" eye floater spheres consist of a core and a surround. Tab. 5: "Alteration of the state:" eye floaters change between "concentrated" and "relaxed" states. Tab. 6: "Light:" eye floaters‘ luminosity depends on our state of consciousness. Tab. 7: Eye floaters tend to sink to the bottom, this can not be explained by gravity. Tab. 8: The light in the eye floaters jumps ("quantum leap") depending on the state of consciousness. Tab. 9: Light structure floaters are therefore a neurological phenomenon of consciousness. In ophthalmology, shining structure floaters (see „Introduction“) are believed to be vitreous opacities. At first glance, this explanation makes sense. But it is just the current state of knowledge, unproven and unsteady. The vitreous opacities thesis is based on the materialistic-mechanic philosophy, which frames Western thinking for several centuries. Thus, it is perfectly comprehensible for us if the dots and strings are deemed physical objects moving in the vitreous body depending on the eye movements, gravitation as well as hydro- and thermodynamics. However, there is no evidence for this explanation. That’s because these dots and strings are subjective phenomena like our thoughts. Can thoughts and other consciousness phenomena be proven in a natural scientific sense? It can maybe indirectly, by discovering neurological, biological, chemical etc. correspondents in the nervous system. The same applies to shining structure floaters: Generally, eye doctors are unable to see these dots and strings in the vitreous body of the patient. Then they say, the floaters are too small or too near to the retina. Some even argue that floaters are not in the vitreous body at all, but in a space between vitreous body and retina, the so-called premacular bursa. Even if the doctors locate vitreous opacities – is it really what the patient sees? With laser surgery and vitrectomy, some kinds of eye floaters can be removed. These procedures could also alter the perception of shining structure floaters. Even if this happens, it does not prove that shining structure floaters are located in the vitreous body. Laser surgery and vitrectomy can remove certain kinds of vitreous opacities. Laser therapy candidates, for example, have to fulfill several conditions: their vitreous opacities should be small in number, not too mobile, have enough distance to both lens and retina, and, most importantly, they must be visible to the eye doctor in order to be split up or vaporized by the laser. To laser specialists, shining structure floaters are typically known as non-visible and non-treatable floaters in “younger patients”. Vitrectomy is the procedure of removing and replacing parts of the vitreous body. Formerly, vitrectomies were carried out only in patients with severe retinal and vitreous damages because of the risks. Today, a growing number of eye doctors and hospitals offer vitrectomy with the only purpose to remove floaters (floaters only vitrectomy, FOV). Several recently published clinical studies confirm that the procedure is safe and effective. However, this should not mask the fact that vitrectomy is still a risky surgical intervention and often causes cataract and additional opacities (“frill”). Even if a patient is free from floaters after surgery, it is usually unclear what kind of floaters have been removed. For surgeons, there is no need to distinguish the types of floaters in their patients’ eyes, because they are all removed with vitrectomy. And even if the shining structure floaters are no longer perceived after surgery, other reasons than the removal of vitreous humor could be responsible. A possible explanation might be that the removal of the vitreous ultrastructure alters the light scattering; thereby, the light does not reach the retina and stimulate the visual nervous system as it did before. This also means that consciousness processes are altered, thus influencing the visibility of the shining structure floaters that respond to these processes. For these reasons, the success stories of laser therapy and vitrectomy should not be taken as evidence to locate shining structure floaters in the vitreous body. The subjective perceptions during open eye meditation reveal visual qualities of the dots and strings that cannot be explained by the vitreous opacities thesis, namely the “dual structure”, the “alterations of the state”, the “light”, the tendency to sink, as well as the “quantum leap” principle. These qualities suggest that shining structure floaters are a consciousness phenomenon. The ophthalmological explanatory model of shining structure floaters works fine as long as we just take a glimpse at our dots and strings. However, if we scrutinize them through open eye meditation, the dots and strings reveal qualities that cannot be explained by that model. It is important to understand that the following arguments are rooted in Nestor’s and my own observations; and that there is no guarantee that the dots and strings look the same way with everyone. Rather, everyone interested is called on to mindfully observe her or his own dots and strings for an extended period of time – to discover what she or he really sees, and to decide if they really are vitreous opacities or rather a phenomenon of consciousness. he „dual structure” means the fact that floater dots or spheres consist of a core and a surround. There are two kinds of spheres: those with bright surround and dark core, and those with dark surround and bright core. Observing our shining structure floaters leads to the finding that there are dots or spheres and strings. The strings are filled with strung-together dots which are more or less distinctly and visibly. The dots are circular and concentric, i.e. they contain a core and a surround. 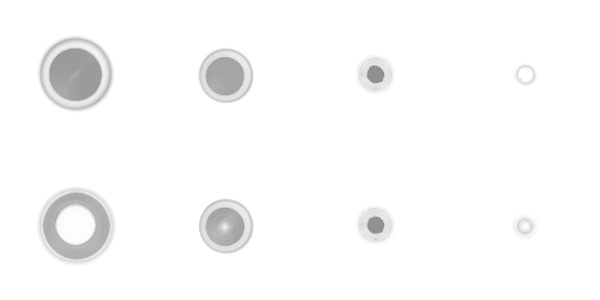 There are two kinds of dots: those with a bright surround and a dark core, and those with a dark surround and a bright core. The two complementary kinds of floater spheres. Source: FT.
As stated above, these If we believe present-day ophthalmology, these spheres must be aspects of the vitreous fibers which are clumped together due to age-related changes of the vitreous body. However, this is rather hard to believe if we take a closer look at the ultrastructure of the vitreous body. 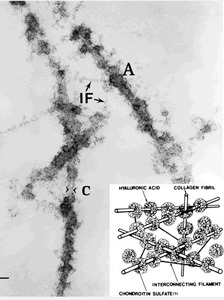 This structure consists of collagen fibers which are coated with molecules of hyaluronic acid. 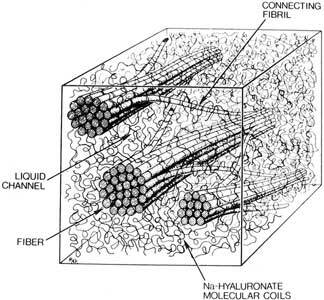 Microscopic picture and schematic of the ultrastructure of vitreous collagen-hyaluronan fibers. Source: Asakura, A. (1985): Histochemistry of hyaluronic acid of the bovine vitreous body as studied by electron microscopy. Acta Soc Ophthalmol Jpn 89, Nr. 179. Schematic of the vitreous collagen-hyaluronan fibers. Source: Sebag, J.; Balazx, E. A. (1989): Morphology and ultrastructure of human vitreous fibers. In: Invest Ophthalmol Vis Sci 30. Though it is conceivable that these structures clump together and become visible opacities when the vitreous body liquefies and detaches from the retina, it is unlikely that this clumping results in single dots with such regular dual structures. I therefore conclude that shining structure floaters are not clumped together vitreous fibers. “Alteration of the state” means that the same spheres and strings appear bigger and rather smooth-edged, or smaller and clearly outlined. When carefully observed, it becomes clear that both kinds of shining structure floaters pass through different states. One and the same sphere or string can appear rather big and smooth-edged, or small and clearly outlined. The transition from one state to the other is continuous and proceeds at varying speeds. I distinguish a relaxed state from a concentrated state. In general, it seems that the shining structure floaters are initially relaxed, i.e. they appear bigger, closer and more transparent. With increasing time of observation, they change into the concentrated state. The concentrated state can again change back into the initial relaxed state, after breaking concentration - a quick glance to somewhere else will do. The two kinds of floater spheres in transition from a relaxed (left) to a concentrated (right) state. Source: FT.
From an optical point of view, these “state alterations” could be explained by the floaters’ distance to the retina: the closer floaters are to the retina, the smaller are their casted shadows, and thus the smaller and more outlined they appear in the observer’s visual field. 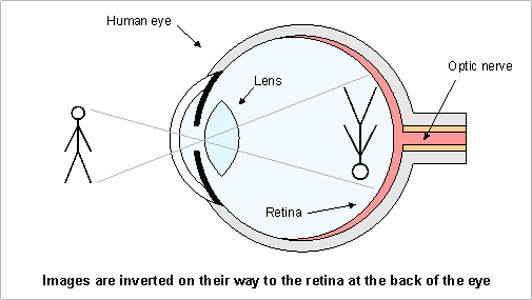 However, this would mean that the floaters move backwards to the retina during the act of seeing. This could be the case if we assume that the observer tilts his or her head back to look at the sky. However, the same effect appears when looking down. Also, the relative stability of the states jars with the notion of particles swirling in the vitreous body; with every eye movement, floaters would have to accidentally appear concentrated and relaxed. In reality, however, it often takes some time to experience the transition from the relaxed to the concentrated state. Furthermore, the spheres and strings contain “light”, i.e. they “shine” depending on certain inner and outer circumstances like concentration, lighting condition etc. It is interesting that the floaters’ brightness increases when the dots and strings enter their concentrated state. To explain this in terms of energy, the same amount of light or energy is condensed on a smaller space. This effect can be influenced by “external” factors: for example, it is intensified by bright lighting conditions and the distance of the focal point – the closer the focal point, the brighter the floaters. Also, observing the spheres and strings through the eyelashes or a pinhole in a sheet of paper lets the floaters appear concentrated. At the same time, our ability to concentrate is equally influential, since this shining concentrated state of the dots and strings can be induced simply by observing the floaters for an extended period of time. In my German newsletter “Ganzheitlich sehen” (2/2005), a reader who experienced this by herself asked several eye doctors for an explanation. More than half of the doctors who answered at all, did not respond to that fact. 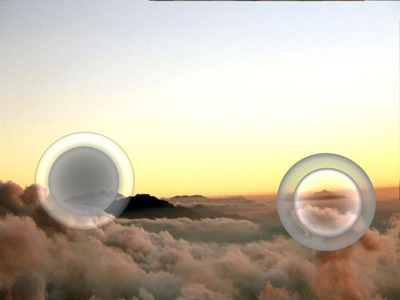 A few commented with notions of light scattering, focusing and reflection in the eye, suggesting that eye floaters work as converging and diverging lenses. However, this cannot explain the repetitive and regular pattern of the transition of floaters from the relaxed to concentrated and luminous state. Still others attributed the perception of light to changes of consciousness that are caused by concentration, meditation or autosuggestion. Thus, these eye doctors admit that the vitreous opacities thesis cannot fully explain the shining effect and that the perception of floaters is influenced by the state of consciousness. However, they pay no attention to the individual perception for it is deemed an optical illusion and not relevant for the diagnosis. In summary, the result of that query confirms the overall impression: the traditional ophthalmological explanatory model cannot explain these alterations of state and brightness that occur when we focus on our shining structure floaters. Shining structure floaters tend to sink. However, because of the inversion of the image on the retina, this cannot be explained by gravitation. The dots and strings can be directed to any part of our visual field when moving our eyes accordingly. But as soon as we keep our eyes still, we realize that the dots and strings – especially the bigger and nearer ones – tend to sink down. Gravitation seems to be a plausible explanation for this sinking. However, as we know, our eyes project an inverted image of what we are looking at on the retina. If floaters were particles that are pulled down by gravitation and cast shadows on the retina, then we would have to see floaters rise in our visual field. Since we do not see floaters rising but sinking, the conclusion would be that the corresponding particles in the vitreous do not sink but rise. If that is true, other forces than gravitation must be responsible for that upward movement of floaters. I have asked dozens of eye doctors about that phenomenon, and their answers are far from clear. Some avoid the question by stressing that floaters move in all directions. Others argue that the floaters we see sinking in our visual field do indeed sink in the vitreous body, according to the law of gravitation. Their arguments, however, miss the heart of the matter for they regard floaters or the retinal image in isolation: either the respondents argue that the floaters are not outside, but in the eye and their shadows are thus not inverted on the retina; or that the brain reverses the inverted image. Per se, these arguments are correct, but if we relate the floaters’ shadows to the rest of the inverted retinal image, the question is still not solved. Still other respondents think that if floaters subjectively sink down, they actually rise in the vitreous body. To explain this rise, they speculate about thermodynamics (floaters rise through heat) and density (floaters rise because they are lighter than the vitreous humor). In sum, the question is unsolved. The term “quantum leap” effect integrates several observations during intense states of consciousness. They give rise to the insight that shining structure floaters are not flowing particles, but light which “jumps” between different layers of our multi-layered consciousness space. 1. 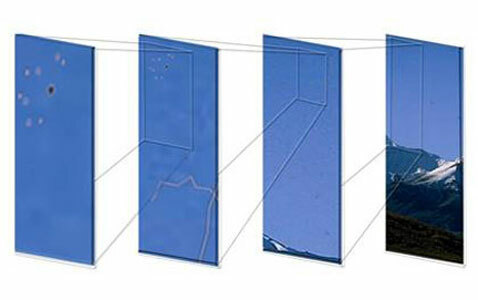 Usually, we perceive shining structure floaters as objects that constantly flow in our visual field. However, in more intense states of consciousness, a seer sees that the spheres and strings actually jump. Each of their movements is the result of a lateral, vertical or depth jump. This observation suggests that there are several “layers” in our visual system or consciousness space where visual perception takes place. This means that one and the same visual object exists on different layers, but on each layer has a different size and luminosity. The above mentioned “state alterations” can be explained in this sense: Concentration and relaxation causes the light to be projected on different layers – thus we see one and the same floaters smaller and brighter, or bigger and rather transparent. 2. When entering a more intense state of consciousness, a seer sees one and the same floaters (as well as all physical and entoptic objects in his or her visual field) abruptly getting nearer, bigger and more luminous. This “zoom effect” wears off only after a while, when the seer enters into the concentrated state. Again, in the case of the “zoom effect”, the spheres and strings jump from one layer of consciousness to another, but skip several layers so that the size and intensity of the floaters seem to change all of a sudden. In the following, I use the term “layer” or “layer of consciousness” to address the big “quantum leap”-like movements of floaters; smaller jumps as in the case of the “state alterations” take place between more subtle layers, which I call “lamellas”. As I have suggested elsewhere (Tausin 2008), our consciousness space or visual system works like a hologram. Therefore, we can assume that in each “layer of consciousness”, there are several “lamellas”; in each “lamella”, there are again several sublayers and so on. This explains why the movement of shining structure floaters can appear as both constant flowing, as well as big and abrupt jumps – according to our consciousness state. Shining structure floaters on different “layers of consciousness”. Source: FT.
3. Seeing while being in more intense consciousness states reveals that it is not material particles that move constantly or abruptly but light. One and the same visual structure or object is successively illuminated on different layers and lamellas and accordingly varies in size and intensity. Thus, what we call “eye floaters” is a spatial and temporal alteration of the energetical settings in a space, in which energy – visible as light – is transported through space. Eye floaters, then, are a wave phenomenon. In summary, all of these observations suggest that eye floaters are not moving particles in the vitreous humor, but light which jumps between several visual or consciousness layers. Therefore, shining structure floaters are a consciousness phenomenon. If they have a physiological correlate, neurological processes are the most promising option to look for. However, this question does not matter for open eye meditation. The question about the relationship of spirit and matter is a philosophical question. The seers’ world view, based on their seeing of the shining structure, stresses the development of matter from consciousness through gradual condensation. All processes have correlates on each stage of density. This means that consciousness processes – and, therefore, shining structure floaters – are represented in physiological structures and processes. If the physiological correlate of shining structure floaters is not the clumped together collagen fibers in the vitreous body, what is it then? At present, the answer is unclear. My guess is that the spheres and strings correlate with processes of the visual nervous system, as it is the case with other entoptic phenomena (Tausin 2011). Investigating that question is interesting, but it produces no more than abstract knowledge. Open eye meditation on the other hand produces a consciousness of our connectedness with everything through this shining structure.